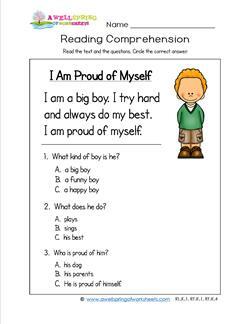 Please go to this page for more kindergarten reading worksheets. 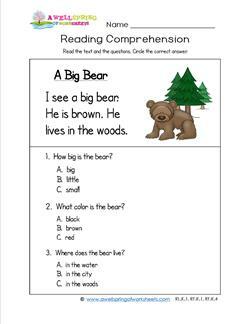 This big brown furry fella is the topic of conversation in this kindergarten reading comprehension page. Even in a reading comprehension worksheet kids can get in a little math - count the shoes on this bug! Who has the longest neck you'll ever see? 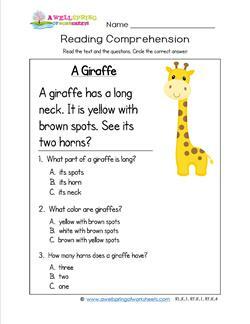 A giraffe, of course! Kids read about his neck and the color of his spots. This little dinosaur looks a little sheepish and shy. Kids read about his plight and wonder where his mommy is. 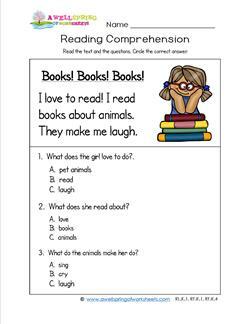 Kindergarten Reading Comprehension – Books! Books! Books! 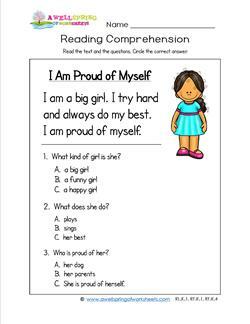 The girl in this reading comprehension passage is an avid reader. Want to join her? 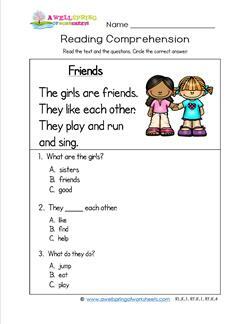 Having a friendship like the one in this kindergarten reading comprehension passage is the way to go. 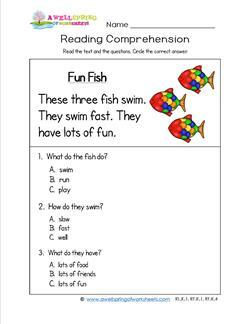 This kindergarten reading comprehension sheet features three friendly fish swimming all around. Who can resist a little cutie like this who feels good about himself and his accomplishments. This little girl looks so sweet and yet so self confident. It's more than just "girl power". This robot doesn't talk, but if he did, what would he say? "Teach me to read."? or "Read another book to me."? 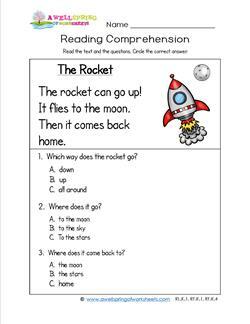 This kindergarten reading comprehension worksheet uses quotation marks and exclamation points. 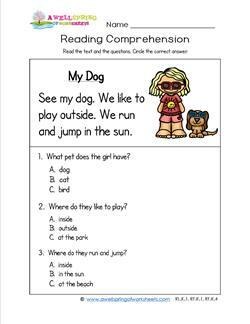 This reading worksheet for kindergarten features this cool little girl and her cool little dog. 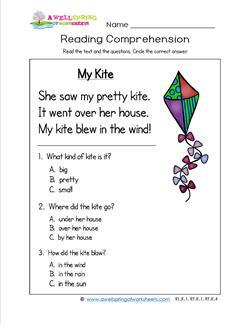 This is a good reading comprehension worksheet for spring when the breezes blow and kites abound. 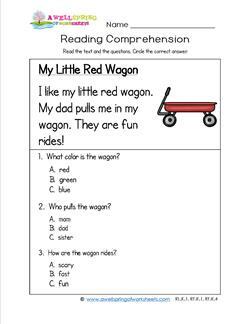 This kindergarten reading passage has a little red wagon - a childhood favorite. 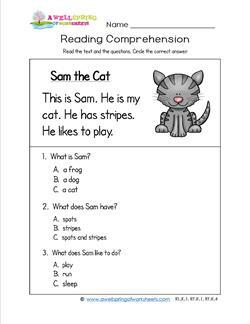 Please enjoy this kindergarten reading comprehension about Sam the cat. Three questions included. Spring flowers are so beautiful! 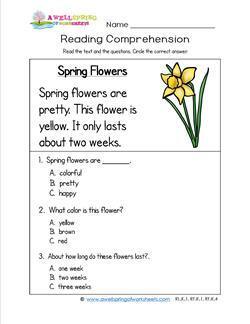 As this reading comprehension page says, some flowers don't last very long. 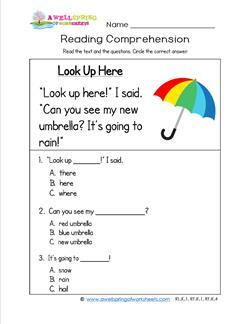 Kids can use their imagination when reading this reading comprehension page. What is the moon like? 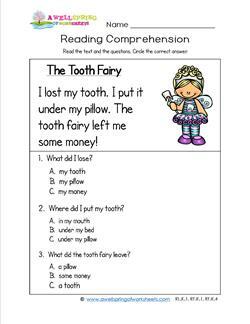 A kindergarten reading comprehension worksheet about losing a tooth and what happens next.